Really Simple Syndication (RSS) provides a quick way to read the latest updates from your favorite websites. Many websites offer RSS Feeds so that when a news article or a summary of an article is posted, it's also sent to your RSS Feed folder in Outlook. If you've added an RSS Feed to Outlook and want to unsubscribe from the RSS Feed, see Remove an RSS Feed from Outlook. The first time you add an RSS Feed to Outlook, you're prompted to choose if you want to keep your RSS Feeds subscriptions list synchronized between Outlook and the Common Feed List (CFL). Regardless of the option you choose, you can change your choice later. On the File tab, choose Options > Advanced. 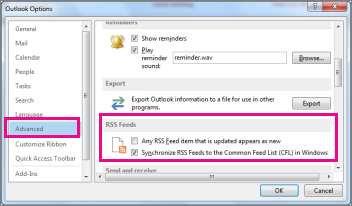 In the Outlook Options dialog box, under RSS Feeds, select or clear the Synchronize RSS Feeds to the Common Feed List (CFL) in Windows check box. On a webpage, choose the RSS Feed icon, such as , or, , for the content you want to receive. When the RSS Feed opens in Internet Explorer, choose Subscribe to this feed. Note: If you haven't opted to synchronize your RSS feeds to the Common Feed List (CFL) in Windows, you won't see that RSS feed in Outlook. In Outlook, right-click the RSS Feeds folder and choose Add a New RSS Feed. In the New RSS Feed dialog box, enter the URL of the RSS Feed. Tip: If you need help finding the RSS feed URL on a website, look for an RSS icon. Right-click that icon, and then copy the shortcut to the Clipboard. Press Ctrl+V to paste the information from the Clipboard into the RSS Feed location box. To read a subscribed RSS Feed, see Read RSS Feeds. To remove an RSS Feed from Outlook, right-click the folder containing the RSS Feed and choose Delete folder. This action will unsubscribe you from the RSS Feed in Outlook. Note: You can't delete the default RSS Feeds folder from Outlook. But you can delete any subfolders that contain RSS feeds you've added. You can also remove an RSS Feed through the Account Settings dialog box. Choose File > Account Settings > Account Settings. On the RSS Feeds tab, choose the RSS Feed you want to unsubscribe from, and then choose Remove. Note: If you can't remove an RSS Feed in Outlook, and you synchronized Outlook with the CFL, see Remove an RSS Feed that keeps reappearing in Outlook.